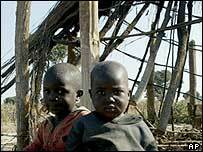 BBC NEWS | Africa | What lies behind the Zimbabwe demolitions? The homes of some 700,000 Zimbabwean city dwellers have been demolished in the past few weeks, according to the United Nations. 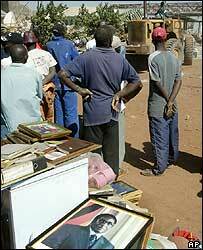 See before and after images of township clearance in Harare. Police have been moving from area to area, in some cases forcing people to knock down their own homes. In others, they have turned up with bulldozers to demolish structures which they say have been built illegally. "We were busking, enjoying the winter sun when we heard trucks and bulldozers roll in. There was pandemonium as we rushed to salvage the little we could," one resident of the capital, Harare told the BBC News website. "In no time the cottage I had called home for three years was gone. Then it dawned on me that I was now homeless, you try and pinch yourself and wake up but this was no dream. My life had been shattered before my very own eyes." Worshippers at a Harare mosque have even been made to destroy it, says opposition MP Trudy Stevenson. Thousands of desperate Zimbabweans are living on the streets, others have gone back to their rural homes, while some have managed to squeeze into parts of the cities not yet touched by what some are calling the "tsunami". President Robert Mugabe said "Operation Murambatsvina [Drive out rubbish]" was needed to "restore sanity" to Zimbabwe's cities, which he said had become overrun with criminals. His critics say it is no coincidence that opposition to his rule is strongest in urban areas - and that in March the opposition Movement of Democratic Change (MDC) won almost all urban seats for a second election in a row. "This is harassment of urban voters," MDC secretary general Welshman Ncube told the BBC. He says the government wants people to go to rural areas, where they can be controlled more easily. "It could also be a pre-emptive strike against poor urban people who will be worst affected by the inevitable hunger which is going to stalk the population in the next few months." The UN World Food Programme estimates that more than three million people will need food aid in the coming year. Some of the areas where whole rows of houses have been destroyed, such as Mabvuku and Tafara, have seen anti-government riots in the past few years. So far, the security forces have managed to put a lid on such protests and prevent them spiralling into mass demonstrations capable of toppling the government. But maybe Mr Mugabe does not want to take any chances. Zimbabwean politics is, however, rarely that simple. Many of the illegal structures which have been demolished were built on farms seized from their white owners in the past five years of a controversial land reform programme. This is Mr Mugabe's core policy and most of those who have moved onto the farms are supporters of his Zanu-PF party. Zanu-PF chief whip Jerome Macdonald Gumbo points to this as proof that the operation is not political. "Harare used to be a very smart town. Now it has become dirty and dangerous," he said. "The exercise is painful but it has to be done. It is a necessary evil." Mr Ncube says that the government is actually quite glad to be moving against the war veterans, who spearheaded the invasion of white-owned farms in 2000, attacking opposition supporters as they went and paving the way for Zanu-PF's victory in the 2000 parliamentary elections. "If they could destroy the war veterans, who have been holding this government to ransom, that would be an added bonus," he says. Last year, Jabulani Sibanda, the leader of the veterans of Zimbabwe's 1970s war of independence, was disciplined by Mr Mugabe, after being identified with a Zanu-PF faction which had fallen from the president's favour. Human rights lawyer Brian Kagoro agrees that the eviction of Zanu-PF supporters from the farms shows that Operation Murambatsvina cannot simply be described as punishment for pro-opposition urban voters. But he says that whoever the victims are, their rights have been violated. "They should have been given adequate notice. Children have been pulled out of school and people with Aids have had to stop their treatment." 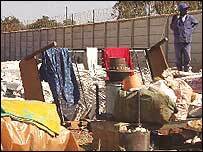 Some have been living in their shacks for more than 10 years and been told to demolish it in a single day, he says. He also says that the government is destroying informal "flea markets" in order to tighten its control of the economy. Most of all, the government wants to bring all the foreign currency generated in Zimbabwe into formal structures and stamp out the black market. Some traders have been found with huge caches of foreign currency. Mr Gumbo denies that the action has been unfair. "These people knew that the structures were illegal - we always told them not to build them. They did not think the government would take any action," he said. He also accuses the opposition of hypocrisy, after previously criticising the government for tolerating a situation of lawlessness. A coalition of opposition groups, including the MDC, last week organised a general strike to protest at the demolitions but it was a failure. Mr Ncube says that Zimbabweans are angry but they are not prepared to stand up and take the risks needed to change the government. "Every second person wants someone else to take action on their behalf." So he is reluctant to predict that the demolitions will alienate a new section of Zimbabweans from Zanu-PF and drive them into the arms of his party. "This government has been shooting itself in the foot for a long time, alienating more and more constituencies. The question is whether the people are willing to take political action," he says.